On Tuesday, March 13, the Hillsborough Township Committee announced a plan to expand local indoor and outdoor sports facilities by introducing two (2) ordinances and approving a resolution aimed at paving the way for the construction of Apex adjacent to the existing Mountain View Park. In order to facilitate the project, the Hillsborough Township Committee is looking to enter into a lease agreement with Apex, and they are also looking to provide a five-year tax exemption to Apex as an incentive to construct the facility. The township and Apex worked together to ensure the facility would be available to the community and the township’s youth first by designating one (1) outdoor turf field as the “Township Field” which will include lights and bleachers. On this Township Field, Apex will provide 400 hours of field usage annually at no charge to Hillsborough Parks and Recreation programs as well as a discount of 50% off market rates for local 501(c)3 organizations. The Hillsborough Township Committee will vote on these ordinances at the committee meeting on March 27. 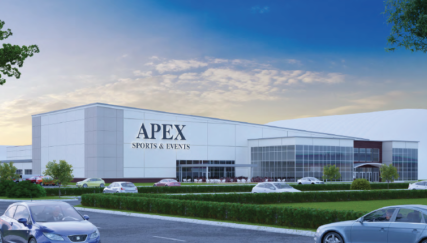 Gregg and Jen Wilke (local residents since 2003 and local business owners since 2012) are proposing to build Apex which will be a state-of-art indoor/outdoor multi-sport, training, and events facility that will make a positive impact on the local community and surrounding area. This multi-faceted project will feature proven services, pre-existing programs, and established management practices in conjunction with state-of-the-art sports spaces, cutting edge and innovative training elements, adventure amenities, and event spaces all aimed at providing a one-of-a-kind experience in a unique facility tailored to the needs of local and regional athletes, recreational users and families. The operating plan will ensure long-term sustainability and in turn serve the growing needs of the area’s sports and recreation participants. Apex is designed to serve consumers of sports leagues, training, skill-building clinics/camps, and competition as well as sports performance training, pay-to-play recreation experiences, team-building events, adventure programming, youth development activities, birthday parties, and youth summer camps. These core programs will provide a solution to local and regional sports, recreation, and event needs. The result is a project that assists in the development of athletes, encourages healthy lifestyles and creates a welcoming, social experience for youth, adult, and family participation, as well as making a positive impact on the local economy. Apex is a perfect compliment to the outdoor sports and recreation activities that will be offered by the township and county at Mountain View Park. Apex Sports and Events will feature three structures adjacent to each other as well as outdoor multi-purpose fields. The first is an approximately 100,850 square foot hard structure featuring the hardwood court area, play climb area, redemption arcade, rock climbing gym, a mezzanine viewing area, a second floor events area, café and seating area, multi-purpose rooms, team rooms, conference room, restrooms, retail leased space, and other supporting spaces. There will be two air-supported dome structures connected to the hard structure through air lock doors. The facility’s eastern portion is a 86,400 square foot air-supported dome that will be inflated year-round. With top-of-the-line synthetic turf, Apex will be able to host and promote a variety of field configurations and competition and training formats across various age groups. The 330ft x 210ft field will host training, clinics, camps, and competition for all rectangular-field sports programs such as soccer, lacrosse, football, field hockey, rugby, etc. The field can also divide into three 210ft x 110ft fields to allow for multiple games and activities at one time as well as multiple youth development classes and sports performance training. In addition to multi-purpose field sports, the turf field will be developed to accommodate a 200ft softball/youth baseball field and will include bleacher seating and equipment storage. The rear portion of the facility is another air-supported structure having an area of 22,545 square feet that will also be inflated year-round. Within this dome is dedicated space for sports performance training including six (6) batting/pitching tunnels, an equipment training area, turf training area, and a sprinting track. Adjacent to the indoor facilities will be three (3) outdoor synthetic turf multi-purpose fields and will include bleachers and lights. Careful thought was put into ensuring the best experience for every user whether an athlete, recreational user, spectator, or entertainment-seeker. For local athletes, Apex’s focus will be the complete integration of all aspects of sports training into team practices and workouts using spaces designed to support their specific sport and position while allowing each athlete to train together alongside his/her teammates. For those seeking recreation and/or entertainment, there will be other spaces and programs designed specifically for the recreational user and not specifically for the athlete. Some of these programs are still being defined, but rest assured Apex will offer the community the best balance between sports, recreation and entertainment uses. One of these spaces which deserves more attention is the Play Climb area. Play Climb is the newest category of action entertainment and is transforming the sporting activity of indoor climbing into an exciting and attractive mainstream recreational activity. Click on the following link to see a YouTube video of Play Climb in action!